SPOKANE - A former Spokane Empire player is dead following a shooting at a local restaurant over the weekend. Carl Sims, a wide receiver who played for the Empire during the 2016 season, was killed during a shooting at the Monterey Cafe on Saturday. His former Empire coach, Adam Shackleford confirmed. Shackleford said he received the information from some former players and teammates of Sims. Per KREM, Sims was a bystander in the shooting, meaning he not involved directly. In his single season with the Empire, Sims led the team in all receiving categories. He caught 71 passes for 822 yards (11.6 yards per catch) and 20 touchdowns. He was second on the team in scoring with 138 points scored. “I don’t think I’ve coached a more likable guy in the locker room. He wasn’t into cliques. He was liked by everyone. In eight games with the Nebraska Danger in 2017, he caught 22 passes for 218 yards and 3 touchdowns. 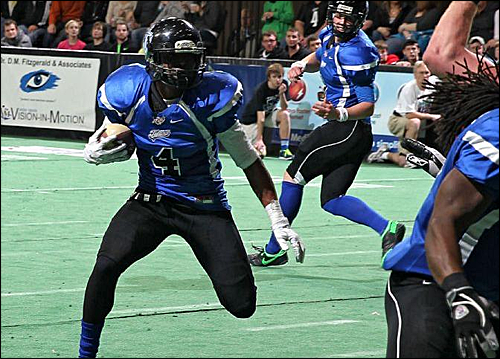 Previous to playing for the Empire, Sims played for the Sioux Falls Storm and Cedar Rapids Titans in the IFL. Sims is one of few players to compete in all nine of the IFL's seasons. He tallied 5,046 and 111 touchdowns during his career. Sims, a 6'0" 190-lb. receiver, attended Western Illinois University where he played for the Leathernecks. He finished his college career there with 136 receptions for 1,724 yards and 11 touchdowns. This is so sad. My prayers and well wishes go out to his family.